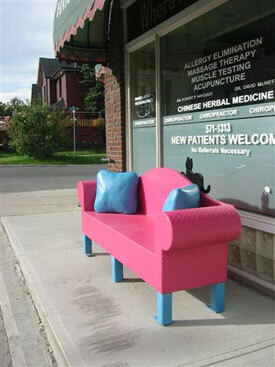 Chippendale couch adds a touch of whimsy to 4th Street by reconfiguring an antique couch and placing it in a modern street setting using contemporary materials and colours. This familiar and classic design has been redesigned to suit public use and pedestrian traffic. An antique brought to the masses in the form of textured metal with two concrete cushions and a laser cut cat. By Karen Ho Fatt 2004. Karen has won numerous awards for her sculpture and furniture design work. She is a full time artist and the creative director of Arkifx Design specializing in Architectural illustrations, painting, sculpture, and project management.